CALL FOR VENDORS | Patchogue Arts Council, Inc. The Patchogue Arts Council is proud to present a CALL FOR VENDORS for the The Art of Shopping: A Holiday Fine Arts & Goods Boutique in New Village featuring Long Island Artisans. 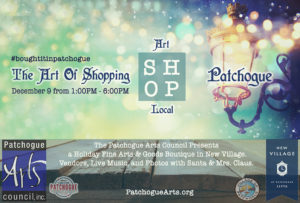 In partnership with The Greater Patchogue Chamber of Commerce and New Village at Patchogue, the Patchogue Arts Council is excited to announce a call for vendors to participate in the The Art of Shopping: A Holiday Fine Arts & Goods Boutique to be hosted in New Village, Patchogue, a festive, family friendly event that will feature a curated selection of vendors selling Fine Arts and Goods from 1:00 PM – 6:00 PM on December 9, 2017 in the event room located at 1 Village Green, Patchogue NY. This event will feature live music, raffles, and a special photo opportunity with Santa and Mrs. Claus for a cause. All funds raised will help the Patchogue Arts Council continue its mission to encourage, support, and promote the arts while aiding in the revitalization and sustainability of the community. This event is part of the Village wide holiday events schedule and will be extensively pro- moted in print and digital media through the Greater Patchogue Chamber of Commerce, New Village at Patchogue, Patchogue Arts Council and more. Vendors interested in applying please see the attached application. Interested vendors please follow the guidelines below. The Patchogue Arts Council will curate 12-15 vendors from submitted applications. The space per vendor is a standard 6’ (table provided by vendor). If selected a vendor fee of $100 will be due by December 1, 2017. Submissions must include a bio and or artist statement to be used for promotional materials. All files should be labeled with the artist’s name and number of image. All vendor fees are due by December 1. Selected vendors will pay a fee of $100 per space. Cash or checks must be payable to The Patchogue Arts Council, Inc. If a selected vendor fee is not received by December 1, the space may be released to a new vendor at the discretion of PAC. Please note selected vendors will need to supply all necessary materials and supplies for their spaces. This includes a table, table cloth, and all display related materials. Please note there is no wall space available. Vendors are welcome to bring an easel to set up behind their allotted spaces. No easels or dis- plays can exceed the table width. Selected vendors must be available to set up their spaces between 11-12:30 NOON on December 9, 2017.